With his most recent singles ‘Earthbeat’ and ‘Lost For Words’ still entrancing dancefloors and radio waves, EDM maestro-mind Giuseppe Ottaviani readies his next club strike. He’s teamed up with Californian singer/songwriter Eric Lumiere - the immediately recognisable voice behind Filo & Peri’s smash ‘Anthem’ - for ‘Love Will Bring It All Around’. On his Original Mix, he initially dials into a trance-progressive ethic. Locked around thunderous, purposeful drums, tight, stripped-back percussion loops and mood fuelling, floor-engaging FX, it lights the way for the vocal. To ‘Love Will Bring It All Around’, Eric Lumiere brings his profound, thought provoking, (not to mention devilishly catchy) lyrical/vocal touch. In the drop, channelled by Giuseppe’s masterful dark-to-light, piano-paving transition, the tone turns, with Eric delivering a spiritually uplifting chorus that takes the track to boiling point. 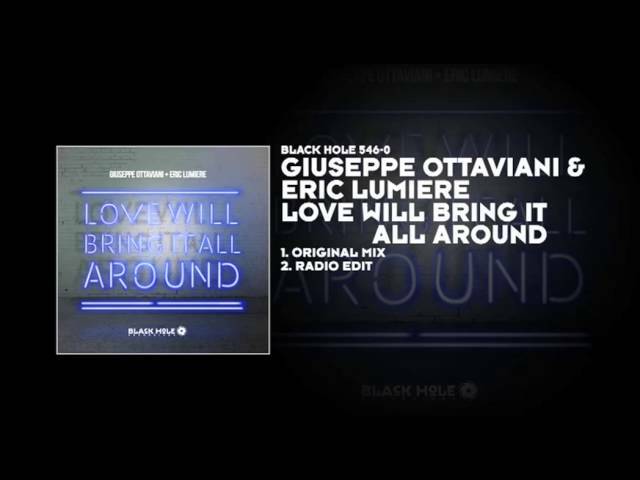 Together, on ‘Love Will Bring It All Around’, Ottaviani and Lumiere deliver trance-land a virtuoso, summer-gateway anthem. Watch this one run to the sun! Supported by Armin van Buuren (A State of Trance 608 2013-04-11), Aly & Fila (Future Sound of Egypt 284 2013-04-15), Solarstone (Solaris International Radio 355 2013-04-16), Mark Sherry (Outburst Radioshow 309 2013-04-19), Pedro Del Mar (Mellomania Deluxe 588 2013-04-22), Sean Tyas (Tytanium Sessions 194 2013-04-22). W&W, Oen Bearen, Binary Finary, DJ Sasj, Big Al, Existone, Pedro del Mar, Kris Shaw, Julius Beat, M.I.K.E., William Daniel (TIllate Magazine), Gareth Stirling, Lence, Matt Cerf, David Casto, Bruce Cullen, DJ Ram, T.O.M., Tempo Giusto, Vicky Devine, Shadowfall, Russell Ogden (Akira Kayosa), Liam Shachar, Woody van Eyden, Kumara van der Gaast, Kay Wilder, Dan Slipper, Dimitri Kechagias, Paul Trainer, Paul Oakenfold (Kenneth Thomas), Michael Myers, Fabio XB, Robert Gitelman, Riccardo Sada, Kyau & Albert, Andy Moor, Ernesto vs Bastian, Andrea Mazza, Talla2XL, Karanda, Raz Nitzan, Woody van Eyden, Blake Jarrell, Nuera, Niklas Venn, Tjerk Coers (Fresh FM), Danilo Ercole, Faruk Sabanci, Ronski Speed, Steve Anderson, Lange, Alle Wagt, Andy Duguid, Gareth Emery, Johan Gielen, Michel de Winter (Radio Hi-Tec), Flash Brothers, Fred Baker, Steve Helstrip and many more!